1125cc vee twin 4-stroke. 4 valve DOHC, liquid cooled. 6-speed transmission with Kevlar belt final drive. Digital fuel injection with zero resistance airbox and pressurised RAM air intake. Aluminium frame with Uniplanar powertrain vibration isolation system, Showa upside down forks and Showa rear suspension, both with compression, rebound and preload adjustment. ZTF front brake with single 6 piston caliper on a 375mm disc. Single 240mm rear disc with floating caliper. And now, the end is near. . . 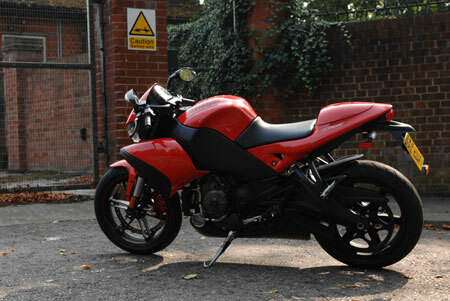 This is a the last Buell I, or anyone else, will ever review. By the time you read this, Buell will be no more. You'll still be able to buy them new until the dealer network sells out, but once they're gone, they're gone. Here at MBT we're almost in mourning. Despite their eccentricities, their occasional foibles and, to be honest, their occasional outright bonkers-ness, we love Buells. Probably because of all those things, to be honest. Buell resolutely stuck to their principles, even when the reason for doing so was perhaps no longer so compelling, and often did things way before anyone else, breaking the ground and paving the way for principles now seen as de rigeur. Mass centralisation springs to mind. 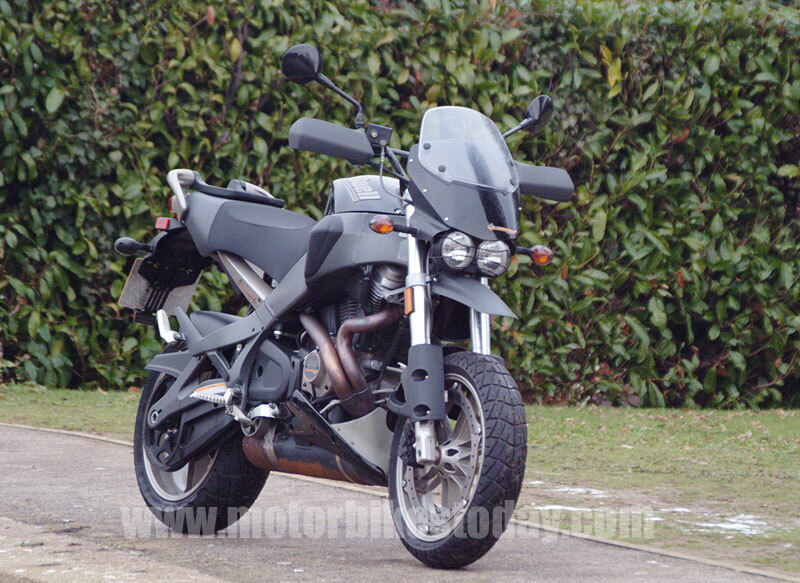 Buell were doing that before Honda (or anyone else) had even coined the phrase. But in the cold hard world of 2009 economics that isn't enough. This isn't a dig at Harley Davidson - they have their own business to protect and God knows they're pretty individual themselves - just a lamentation of the state of the market today. It's also not strictly relevant to this test. When Buell launched the 1125R supersports a while ago it was hailed as all sorts of things. But flawed genius was one of the main descriptions. Genius it certainly was, mating a storming engine with a fabulous chassis and effective aerodynamics to produce a bike that was almost as good as its predecessor, the sublime handling Buell Firebolt. But only almost as good, because it was certainly flawed as well. The fuelling was suspect under some circumstances, especially at launch, and the looks were challenging. But it can't be denied that it was a bloody good motorbike. So at first glance taking off the fairing (which wasn't really very pretty) and making it a naked streetfighter could only be good. The lack of weather protection would slow things down a bit and perhaps allow lower gearing which would disguise the fluffy throttle. Yep, sounds promising. Only this is a Buell. So while they removed the fairing they replaced it with something far uglier. And they left the gearing alone because making this thing accelerate better was, frankly, ludicrous. And it would wreck the fuel consumption as well. See? Flawed genius again - sound thinking but suspect execution in places. So let's look at the bike, then. From the headstock backwards, including the clocks, everything is as before. So we get the same huge underslung exhaust, the same bulbous but very effective and comfortable seat and tail unit, the same tank, the same neat multifunctional clocks, the same excellent engine and gearbox. We also get the same fuel injection, for better or for worse, the same brakes, forks and suspension, the same tyres and the same enormous radiator cowls. In fact, all that has changed over the supersports version is the removal of the main fairing and its replacement with, um, something else. Now let's get this straight. The 1125R had some challenging looks, but the CR really and truly does have looks designed for radio. The radiator cowls, which integrated into the fairing in the sportsbike, now sit like stunted lobster claws on either side of the frame, giving the whole bike the appearance of being dressed for a Dynasty reunion with massively oversized shoulder pads. The headlight sits in a small pod of its own, lost between those massive scoops, while the serpentine exhaust headers work their way around the radiator and drop into the front of the huge collector box. In isolation, perhaps, none of these things would be that much of a problem, but taken together they just make the whole thing look a mess. From the saddle you can't see any of this. You just notice the flat bars and absence of a screen. 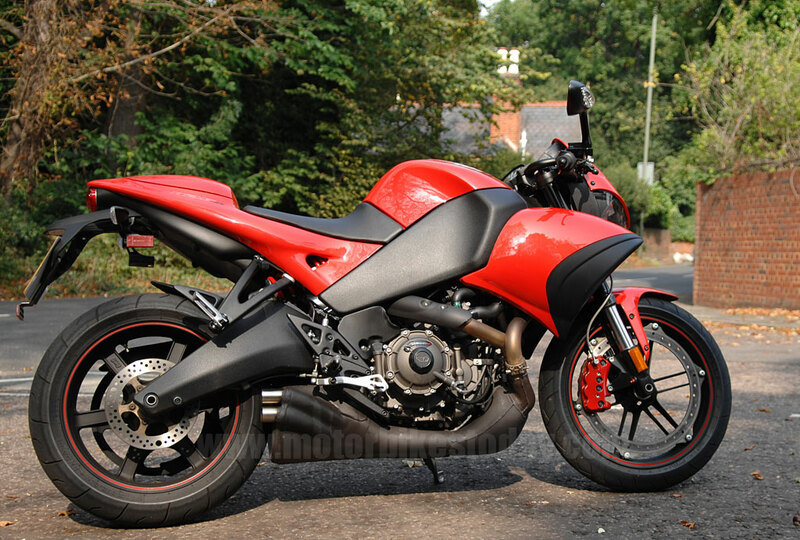 In fact the absence of anything - sit on the naked Buell and it all but disappears below you, with everything apart from the mirrors and clocks hidingoutside your peripheral vision. Glance down and you're looking at the front wheel spindle - straight down the fork legs. You can actually see the massive brake pads grabbing the rim mounted disc. Which I think is pretty cool. But slightly odd feeling. The switchgear is familiar to anyone who has ever ridden a Buell. Or a 1980's Kawasaki, for that matter. Bleeding edge it isn't, but then again what's to change or improve? The layout is utterly conventional and, other than the occasional European aberration, has become the acceptedstandard across all bikes. The actual switchgear isn't especially modern or funky looking, but works perfectly well enough. On the single instrument binnacle there are a couple of rubber buttons to change the display functions. You get an analogue tacho in the middle, regardless, and you'll be pleased to know that the speedo won't go away, whatever you press. But you can select outside temperature, fuel consumption, a clock, trip meter, odometer... In short, there are displays for just about anything you might want apart from a lap timer, as well as several things you'll probably never look at. The buttons are big enough to press with gloves on, too. Enough talking now, lets ride. Turn the key and, as with the 1125R, "Buell Wisconsin" scrolls across the display while the tacho needle does a sweep and everything sorts itself out. The fuel pump whines as it pressurises the system, and like any modern injected bike the Buell is ready to go as soon as you can get your hand from the key to the button. Hit the starter before the checks have finished and the display will keep scrolling but the rest will just behave as usual. When you've hit the starter, though, be prepared for what may turn out to be a disappointment. 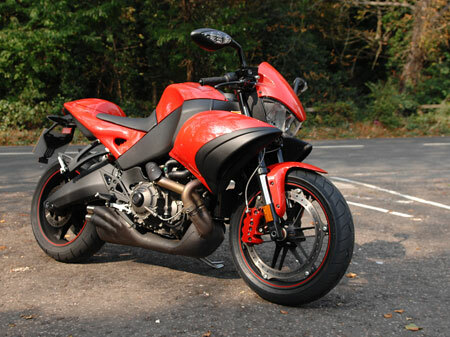 As shipped, the Buell doesn't sound particularly, um, exciting. The liquid cooling jacket and restrictive (and huge) exhaust combine to make it all terribly muffled and inoffensive. Easily enough fixed, of course, but a bit of a shame. It's surprisingly smooth, though, and blipping the throttle shows that it's responsive as well. The fuelling has been further refined since the 1125R and it shows. Happily the modifications should work their way back to the sportsbikes as they get serviced, making things better for everyone. The clutch is surprisingly heavy but easy to adjust for reach, and the new gearbox is smooth enough, especially for anyone used to the box of spanners normally living at the end of the lever on a Buell. Pulling away is a fuss free experience, and everything comes to hand very easily. Despite the invisibility, at a standstill or low speed the size of the Buell makes itself felt. It's not exactly light but the balance is good and the reach to the ground isn't uncomfortable for an average sized person. Having said all that, the Buell is stable at walking speed, and after a few minutes getting used to it I had no problems doing full lock U-turns in either direction. So it can't be that bad. 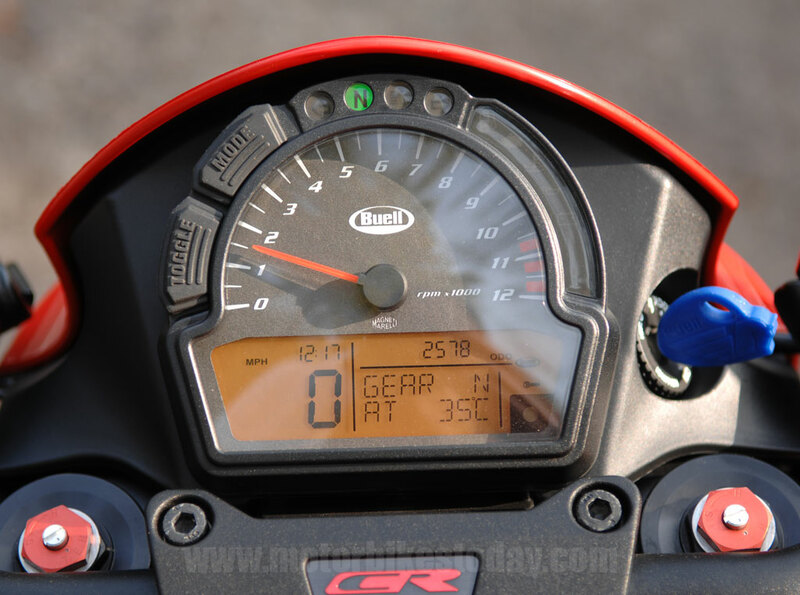 Like its sportier sibling, the 1125CR has a very direct throttle. Direct to the point of jerkiness, in fact. A bit more time getting used to it helped, and had I had the time to fettle all the controls to make it fit me as I'd like then I suspect it would have been better still. But as it is, smooth progress is something that has to be worked at rather than just happening automatically as with some other, less involving machinery. The brakes, too, are rather direct. And astonishingly powerful. Happily, they also have enormous feel, and as such muster among the best brakes on a production bike, ever. Riding the Buell is, as is so often the case, a mix of sublime and ridiculous. Ride it in a half-hearted fashion, be lazy or even just try to ride like a Japanese vee twin and the experience will be unrewarding at best and frankly horrible at worst. Despite the flexible engine, the snatchy throttle response and extremely direct drive from the Kevlar belt means that riding around at low revs is pretty unpleasant. You risk whiplash as well as losing the urgency with which the brilliant engine is capable of thrusting you forward. Anything less than a firm hand with steering inputs results in a bike that feels vague at the front and offers no feedback to speak of. Not something you want on a bike as capable as this surely is. And it really is a very capable machine indeed. Ride with commitment and use the engine's broad rev range to the utmost and you will be rewarded with a fluid, adjustable rapier rather than the somewhat unrefined and brutal claymore with which you are otherwise presented. That vague steering becomes light and sensitive, with masses of feedback and the ability to change lines at the drop of an elbow. The snatchy throttle becomes pin sharp and works with you to tighten or open your turn at your slightest whim. The noise gets a harder, more aggressive edge, the hunched over the front riding position becomes...actually it stays a hunched over the front riding position, but it works really well at keeping the considerable engine power keeping moving you forwards rather than skywards. And the brakes go from being very good to being simply sublime. 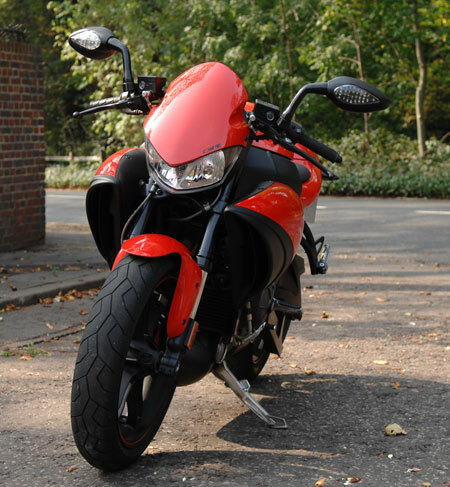 Now you may think that the Buell is massively compromised and only works properly when being ridden in a manner likely to send you directly to Jail, without passing Go or collecting £200. And to an extent you'd be right. Only to an extent, though. I honestly believe that, given the time and approval from Buell I could have made the 1125CR into a far better bike for everyday riding. A bit of clutch adjustment here, some suspension tweaking there and the whole package would have simply been tailored to suit. The only difference between bikes like this and the more mass produced (some might say bland or characterless) offerings from the mainstream factories is that Buells, Aprilias, Ducatis and the like respond far better to being made just a little more bespoke, rather than being ridden out of the crate. As it is, the 1125CR is a flawed masterpiece, but a masterpiece nonetheless. The engine is fabulous, despite the restrictive exhaust. The handling is accurate and fluid when ridden with feeling, it's comfortable, the mirrors work and the brakes are as effective as an unlit skip on a dark night. To put it into perspective, some clown came out of a right hand turning into my path, saw me and stopped dead. Blocking the road. The Buell gave me the time to brake and start turning and was planted enough not to fire me into someone's front garden when I mounted the kerb and used the pavement to avoid making myself into a Kia bonnet ornament. No drama at all, at least as far as the bike was concerned. I was impressed. So. As you'll no doubt be aware, Buell are no longer making bikes. But there's stock in the dealers, they'll stand by warranties and will still be providing their excellent service support. It's quite possible that you could get one hell of a bargain on what is, in all honesty, one hell of a bike. Just take the time to make it truly yours and it will repay your attention in spades.